After a week of hard work and great anticipation for the team's first home game, the Wisconsin Women gained a 28-0 win after the Des Moines Women forfeited the game due to a shortage of traveling players. The win by forfeit earns Wisconsin both the win and the bonus point in the Midwest standings, but left the team from Madison without a home rugby game Saturday and without a match the team felt positive about winning successfully. In a much-awaited physical battle on the road, the Wisconsin Women earned their first loss of the season to the Minneapolis Menagerie, 29-17, in Minneapolis. The match marked the first-ever league game between these two teams after a long history of friendlies. The Menagerie opened up scoring first with a 5-0 lead in the first few minutes after a fullback insert into the backline to break through Wisconsin's defense for a try with a missed conversion. Still a bit tired after the long roadtrip up from Madison, the Wisconsin Women woke up and rallied back to take a 12-7 lead after two tries from Backs Captain Jackie Limberg at Inside Center. Hard rucks and mauling in the forwards gained ball to set up Limberg's tries with assists from her fellow backs, including a particularly nice assist from a two-on-one with wing Perla Cassetta and Limberg sweeping past the Menagerie wing down the sideline. An unfortunate high tackle by a Wisconsin player five meters out from the try line drew a penalty try call from the referee to give Minneapolis a tied game at the halftime, 12-0. Slippery conditions caused by a constant drizzle left both teams with sloppy passes and catches throughout the match. The second half saw both teams continue battling in the forwards with the Menagerie maintaining pressure on the Wisconsin defense and the women from Madison working hard to fringe and stop the Menagerie forwards at breakdowns. The Menagerie rallied again for a try, followed by Limberg's third try for a hat trick in the game and then another try from Minneapolis. However, Wisconsin would falter in the closing minutes after losing a player to a red card from a confusing situation at a late ruck and playing down one player for the final 14 minutes. A final messy ruck near Wisconsin's try line after a Menagerie lineout saw the ball fly out of the bottom inside the try zone into open space. Surrounded by players from both teams, a Menagerie player pounced on the open ball for a final try against Wisconsin. Wisconsin named Lena Arvola (Prop) and Jenn Johnson (Scrumhalf) as the Players of the Game. Arvola turned in an outstanding and physical game in the forwards, drawing high-fives from many of her teammates, while Johnson lead her teammates all day with great communication to the forwards and clean passes despite sloppy conditions to the backline. The Minneapolis Menagerie honored Limberg as their Player of the Game for her three tries. While a frustrating outcome after a loss and traveling with a small roster, including missing Forwards Captain Katie Rouse, Wisconsin felt the match was a success in preparing for greater physical play for future games. 16. Megan Bondehagen (Madison, WI) in for No. 1 Nadia Riese at Prop. Midwest league game vs. Des Moines Women, Saturday, Sept. 20 at Yahara Rugby Field, Madison. 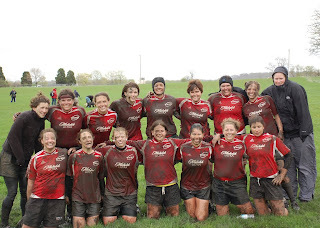 Kickoff - 1 p.m.
Photo: Wisconsin Women after a muddy win, May 2008, photo from Lena Arvola. The Wisconsin Women kicked off their first Division II Midwest season by defeating the Chicago Sirens, 90-7, at Chicago. Backs Captain Jackie Limberg lead her Wisconsin teammates in scoring with six tries for 30 points, while Forwards Captain Katie "Ber" Rouse nailed 10 conversions for 20 points. Normally a forward, Rachael "Rack" Weiker ran in three more tries from her new position on the wing and wowed her teammates with her speed and tenacity. Rachael earned Wisconsin's Player of the Game honors for her hard work Saturday on the wing and also jumping in the lineouts for the first 50 minutes. Rookies Katie Williams (Flanker) and Mary Hanks (No. 8) joined veterans Jen "Petey" Peterson (Flyhalf) and Perla Cassetta (Wing) in rounding out the try scoring. The only try given up was a penalty try due to a high tackle coming off a Siren weakside overload and the ensuing conversion kick. Credit to the Sirens, a young team with a new crop of players, for their hard hits and scrappy play. They disrupted several Wisconsin rucks early on as Wisconsin shook off the summer rust and remembered how to play. Wisconsin was forced to readjust its strategy after the new five-meter rule was not enforced off scrums, but the women from Madison pulled their game together and began to dominate play. Following the match, the Sirens coach congratulated the Wisconsin Women on their "great technical play" and Chicago named Strongside Flanker Katie Williams as its chosen visiting Player of the Game for "being everywhere and tackling everyone". Wisconsin's veterans also applauded the play of the team's new players starting in their first 15s game in the red and white - Williams, Hanks (a UW-Madison graduate), Jenn Johnson (UW Grad) and Megan Bondehagen. 16. Megan Bondehagen (Madison, WI) in for No. 5 Aletha Peterson, at Prop. Katie Rouse to Flyhalf (10), Jen Peterson to Fullback (15), Jessica Burda to Lock (5) and jumper, Nadia Riese to Lock (4), Mary Hanks to Flank (6), Bev Briggs to No. 8. Midwest league game vs. Minneapolis Menagerie, Saturday, Sept. 13 at Columbia Park, Minneapolis. Kickoff - 11:30 a.m. The Wisconsin Women's Rugby team welcomes all interested new players to attend our free Rugby 101 Clinic and Social on Sunday, August 31. The clinic will start at 1 p.m. at Olbrich Park (3154 Atwood Ave., directions link below). We'll wrap the clinic with a social at our team sponsor, Wilson's Bar & Grill, just a few blocks west of Olbrich Park. 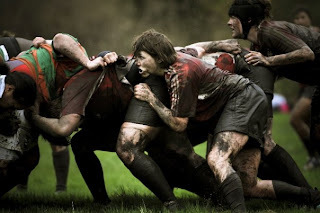 Our clinic is a perfect way to check out the fun of rugby and learn the basics of a new sport. There is absolutely no experience necessary to attend this clinic. For any former club or collegiate players, this is a also a great chance to meet some of our team members and pick up a ball again. For more information, please call our team recruiter, Jen, at 612-327-7345. The Wisconsin Women's Rugby team split into two teams to play each other in 7s at the Wisconsin Rugby Club's (our men's team) annual Stuart Daily Memorial Tournament on Saturday, August 9. Our two teams - Team Awesome and Team Stupendous - battled physically in the match to the delight of the crowd and gave us all a chance to shake off our summer rugby rust. In the end, Team Stupendous claimed the win scoring six tries to Team Awesome's lone try. The day of tournament fun was also capped by a major flip cup victory by the women over the visiting Texas Mercenaries men's team. We nearly swiped all of their cowboys hats too. April 26 - Blue Team wins first annual Luck of the Draw Tournament! 75 senior and collegiate players from across Wisconsin make the LOTD a great tournament. Senior MVP - Meg Dickoff (WWRFC) and Collegiate MVP - (UW-Stevens Point). Fees are $45 including lunch. Location is Herzig College in Madison, to be confirmed. Time 9 am to 5 pm with a Happy Hour to follow. All referees are invited to the Happy Hour for a lively discussion. say 5:30 onward, the location also to be confirmed. E-mail Kate at rugbykate@new.rr.com to sign-up.